The good news is that Burlesque is not the big, hot mess it might appear to be from its trailer and poster. And sure, that’s damning with faint praise, but c’mon … this film just looks like it’s going to be awful — or at the very least, tailor-made for a certain demographic that’s not the one I’m a part of. 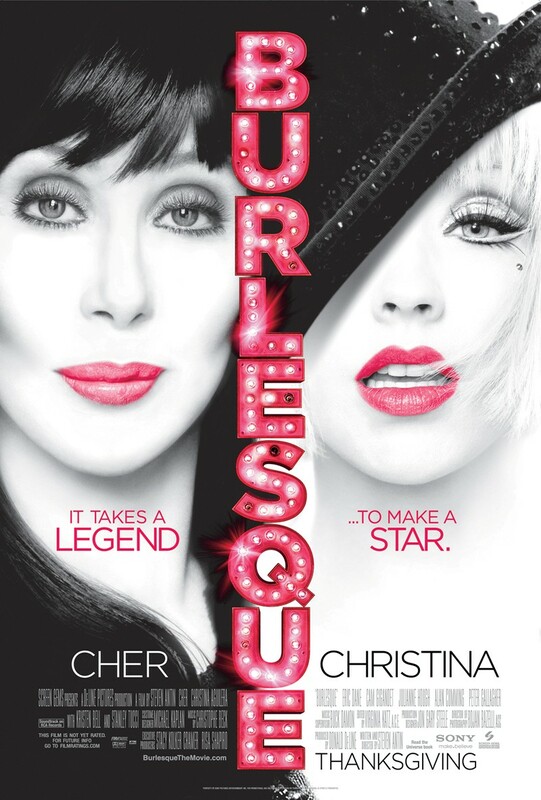 It’s got Cher as the owner of a burlesque lounge in Los Angeles, and Christina Aguilera as an impressionable-but-smarter-than-she-looks, small-town girl, diamond-in-the-rough performer, whose undeniable talent saves the club when it’s in financial dire straits. And as if that’s not enough, Stanley Tucci plays a gay sidekick (again). But I kinda liked the film anyway. In her film debut, Aguilera does a decent job. She’s not great, and not awful. She has her moments, but really, it’s all about her singing. Those pipes are hard to deny. The best parts of the movie are, no surprise, whenever she’s on stage performing — probably because they’re like good music videos. The soundtrack features a few songs that burrowed themselves into my brain and are still swimming around (damned ear worms). And there’s eye candy for both genders — the cast also includes Julianne Hough, Kristen Bell, Eric Dane, and Cam Gigandet. Some credit does go to the film’s writer/director, Steve Antin for not asking anyone to do much heavy lifting (other than the singing and dancing, of course), and generally taking his film seriously enough to deliver something that’s sometimes very enjoyable to watch. That said, part of me kind of wishes Burlesque actually was the hot mess it promised to be. That might have made it a more fun way to spend my time. Sometimes it comes close — some of the dialogue is groan-worthy, Aguilera’s character inhabits so many screen cliches in the first 15 minutes, and Cher’s big number late in the film is a great time to take a bathroom break. The plot itself strains credibility more often than it doesn’t. And I wish there was less handheld cinematography; at times, the film was harder to watch than Cloverfield was. But in taking itself seriously and not going over the top, Burlesque ends up being a mixed bag: It’s not the kind of film that’s going to win Oscars, but it’s not a prime target for Razzies, either. It’s odd wanting a movie to be worse than it is, but that’s because Burlesque caught me a bit off-guard. I liked it enough to rate it a B–.